Refugees and migrants sit next to their belongings before boarding a bus heading to other parts of the country where they will be accommodated, at the port of Piraeus, near Athens, Greece, March 31, 2016. On Monday, the European Union and Greece are scheduled to begin sending migrants, including Syrians, from the Greek Isles to Turkey under a deal reached two weeks ago between the Turkish government and the EU. 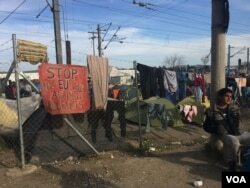 The agreement aims to ease Europe's migrant crisis, but human rights advocates and leftists in Europe have protested the deal, saying it arises from xenophobia. Nationalists and others on the continent are also condemning it, saying it does little to stop the arrival of migrants and will, in effect, open up new channels for them to enter. 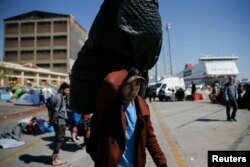 European Council officials say authorities will begin putting those deemed to be new, irregular migrants on ferries to Turkey as scheduled Monday as part of a deal that grants Turkey more than $3 billion in aid, eases visa restrictions for Turkish nationals, and opens new possibilities for Turkey to join the European Union. For every Syrian refugee returned to Turkish territory, Turkey will send one Syrian refugee to the European Union for resettlement. A refugee carries his belongings before boarding a bus heading to other parts of the country where refugees and migrants will be accommodated, at the port of Piraeus, near Athens, Greece, March 31, 2016. But the reality for thousands of migrants now living in camps on the islands of Lesbos and Chios is the prospect of never reaching Western Europe, where many hoped to build new lives far from the war and poverty they intended to escape. The deal has drawn strong criticism from human rights groups. Oxfam's migration policy head Sara Tesorieri said the agreement not only "fails to respect the spirit of international and EU laws, but may amount to trading human beings for political concessions." Amnesty International and other groups say the migrants will be put in danger by being sent to Turkey, a country with a poor human rights record. “In their desperation to seal their borders, EU leaders have willfully ignored the simplest of facts: Turkey is not a safe country for Syrian refugees and is getting less safe by the day,” John Dalhuisen, Amnesty International’s director for Europe and Central Asia, said in a statement released Friday. Last September, when photos showed the body of 3-year-old Syrian refugee Alan Kurdi washed up on a Turkish beach, Europeans rallied in support of helping the refugees. Seeing the slow responses of their governments, private citizens in Hungary, Austria and Germany showed up at camps and train stations with bags of donated clothes and food for the refugees. German Chancellor Angela Merkel led calls for Europe to help deal with the crisis, pressing EU nations to accept quotas and absorb 160,000 new arrivals. 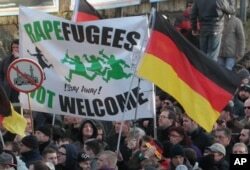 FILE - Demonstrators hold a sign that reads "Rapefugees not welcome! Stay away!" and a sign with a crossed out mosque as they march in Cologne, Germany, Jan. 9, 2016. But the welcome turned quickly into suspicion and anxiety when migrant arrivals swelled to 1 million in 2015 alone. Sweden, long known for its liberal immigration policy, was overwhelmed by the influx and closed its doors, saying it would accept only the minimum number of people set by EU mandates. Then came the terrorist attacks in Paris in November, and scenes of a mob of men — including some migrants — sexually assaulting German women in Cologne on New Year's Eve, fueling further anxiety among Europeans. That anxiety has only grown since the attacks in Brussels, which happened four days after the EU-Turkey agreement was reached. "The heightened security concerns surrounding the Paris and Brussels attacks has understandably led to Europeans feeling far more uneasy about the migrant issue," Tom Wilson, a Middle East analyst at the Henry Jackson Society research organization in London, told VOA. Knowledge that some of those involved in the attacks were known terrorist fighters who had reached Europe among the migrants, he said, "raises a lot of concerns about how European authorities appear to have lost control of monitoring who is actually entering the continent right now." The deportations from Greece are off to a slow start. Officials on Thursday told VOA many of the 2,300 EU security and migration officials who are supposed to help carry out the operation had yet to arrive in Greece. Observers expect the first ferry departures Monday will be largely symbolic and the vessels will be carrying mostly Pakistani men who are classified as economic migrants ineligible for asylum. With a number of nations rebuffing Merkel's proposals for resettlement and governments acting swiftly to enact border control, the message that Europe is no longer open has spread home. The number of refugees arriving in Greece has dropped considerably, and officials say fewer than 5,000 migrants remain in camps in Greece. Despite a provision in the agreement that bars those arriving after March 20 from applying for asylum, some have continued to make the dangerous journey. Of the 143,000 arriving in Greece this year, the International Organization for Migration says 460 have been killed. In early March, at least 25 migrants drowned trying to reach Greece from Turkey. Their deaths only briefly made the news in Europe.